Shoreditch is known to be one of the most artistic neighbourhoods in London, making it a great place to look for street art. Rivington street in the heart of Shoreditch is famous for the iconic graffiti works by the biggest street artists in the country and in the world. This article will introduce you to the key works located on Rivington street. Start your journey from just outside the street itself, with a wall painting by Thierry Noir, one of the largest figures of the contemporary street art. Noir is a French graffiti creator, known to be the first artist to ever paint on Berlin Wall in 1984. There, he created an artwork which constituted 1 km in length in collaboration with another artist. Thierry Noir is notable for his cartoonish colourful faces with disproportionately large lips. You will find one of these on the corner of the Great Eastern Street (84-86 Great Eastern Street, to be exact), only a minute away from the beginning of Rivington street itself. 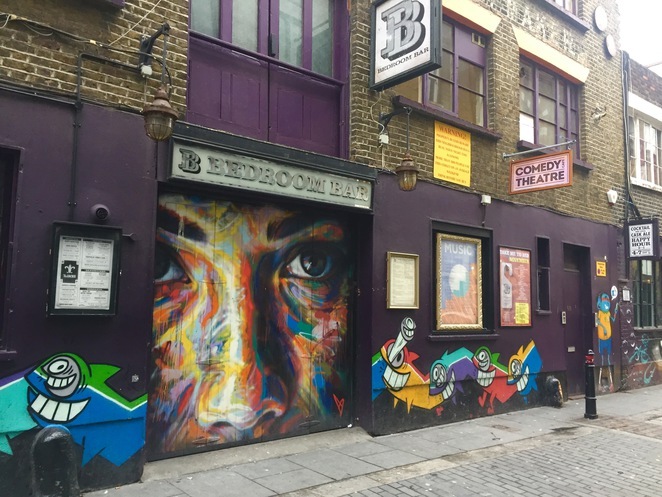 After a short walk towards the middle of Rivington street, you will spot a graffiti by a British artist David Walker, known for his colourful portraits and layered painting. Having become a huge figure in the world of street art in just a few years, today his works can be found internationally, in cities like New York, Hong Kong or Berlin. The next large-scale work was created by a Mexican-born artist from Columbia with a pseudonym Stinkfish. This is another portrait with a characteristic colour pattern. The artist claims to only paint the faces of complete strangers that he once found interesting. He carries a camera with him in order to capture intriguing faces of random people, so he can paint them later on. Another work on Rivington street was made by a British artist Stik. The work is hiding in the corner between two buildings on the street and is not so obvious for a passer-by. However, this work is around 4 meters high, representing a large stick figure, typical work for the artist (hence the pseudonym). 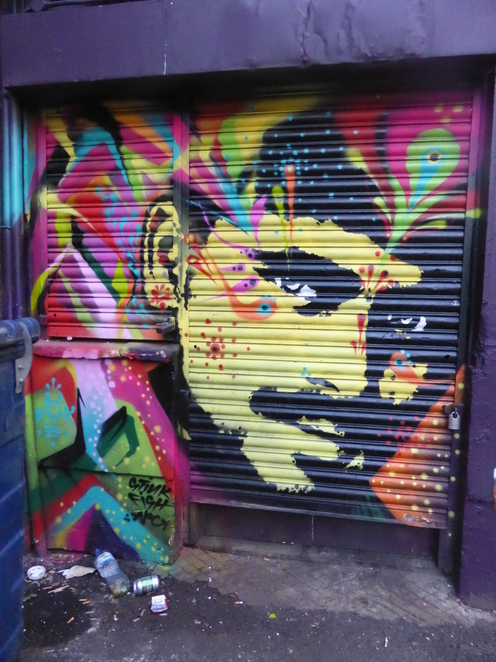 The next work is probably the biggest piece of street art in Shoreditch, attracting many visitors on a daily basis. The graffiti was created by the world-famous street artist Banksy in 2001, and is currently located in the courtyard of Cargo nightclub and portrays a policeman with a poodle, under a warning that says: 'THIS WALL IS A DESIGNATED GRAFFITI AREA'. 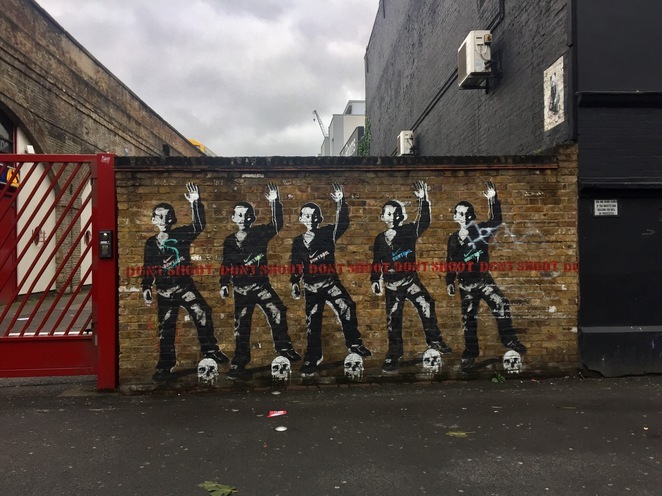 The work is an example of Banksy's satirical style, typically mocking law and social order, as well as his black-and-white stencil art. Banksy has been majorly criticised for vandalism, as his art is deeply political, which often reflects in the specific locations of his works, for example, Israeli West Bank Wall. The identity of the artist remains unknown for the reason of graffiti being a criminal offence. A final stop is just across the street from Banksy's work and is another deeply political work. Don't Shoot is the work done by a female artist Bambi, who is based in London. Bambi's works are famous internationally and are owned by celebrities like Brad Pitt and Rihanna. The graffiti on Rivington Street is dedicated to Michael Brown, a black 18-year-old who was shot by the police in Missouri in 2014, which lead to a series of protests. Bambi's work presents a strong critique towards institutional abuse of power.